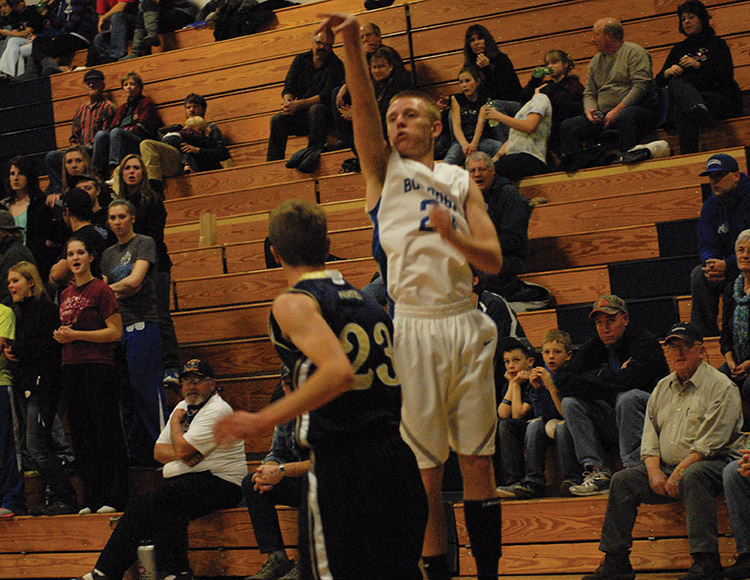 Sophomore Tyler Davis puts up a baseline three during the Moffat County boys basketball game vs. Olathe Friday night in Craig. The Bulldogs won going away in the second half, 59-32. The Moffat County boys basketball team likes to get out and run as much as possible, feeling it is at its best when the ball is getting up the court quickly. The Bulldogs had some trouble playing at their speed for part of Friday night’s game against Olathe at MCHS, but they turned on the jets in the second half. Moffat County scored 20 points in the first 16 minutes followed by 39 in the next 16 to deliver a 59-32 win and improve to 5-1 this season. MCHS imposed its will on the Pirates starting in the third quarter and pushed the game out of reach. Even in the game’s first two quarters, when the Bulldogs were playing at a slower pace dictated by Olathe, their defense was stout. The Pirates mustered just two points in the second quarter and eleven in the half. After a weaker offensive first half, the Bulldogs ratcheted up the pressure and started causing more turnovers, allowing them to get easy, quick baskets in transition. Those eventually led to more rhythm on offense and hitting outside jumpers. There also was a concerted effort in the second half to work the ball into the paint when Moffat County was in its half court sets. Hamilton said he saw a mismatch to exploit. Hildebrandt did not take credit for the extra push inside Friday night. The Bulldogs now look to get another league win with a quick turnover in traveling to Gunnison today. The junior varsity plays at 1 p.m. while the varsity game is set to start at 4 p.m.